Reed Gunther » Archive » REED GUNTHER #10 in Stores Now! 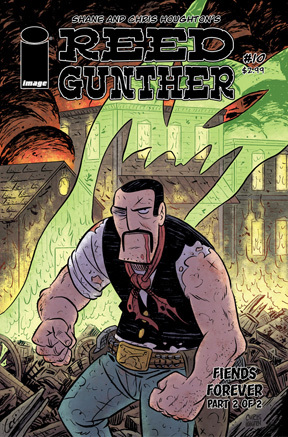 REED GUNTHER #10 in Stores Now! CANNED LETTUCE! We made it! 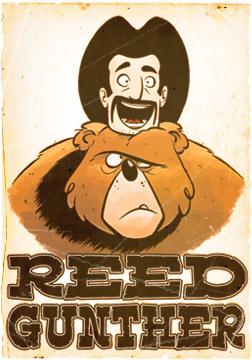 After a brief delay, the tenth issue of REED GUNTHER hits stands with a bang! I don’t want to give too much away about this story, but I will say that Chris and I are extremely proud of this one so we hope you check it out! Hit up your local comic shop to find an issue, or buy it digitally through Graphicly or Comixology! Or read it right here on your computer! I got it today! Great finish guys! You really did a fantastic job with the whole series, and now I keep passing out and vomiting its so good. Yes!